Richard Kuhlman was born in Austin, Texas in 1913 and received a Bachelors in Architecture at UT and his Masters at Harvard in 1942 . Upon graduating, he worked for the Texas State and National Parks systems and started his own firm before joining the Air Force U.S. Engineers during WWII and being stationed in the Phillippines, New Caldonia, and New Guinea. 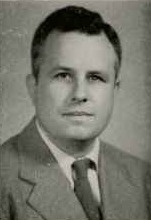 After the war, Kuhlman returned to Texas but left the Lone Star State for good when he accepted a teaching position at OU in Norman in 1946. Two years later, OU professor and official architect Henry Kamphoefner left for North Carolina State University and Kuhlman took his position as the University’s architect. He held the position for over 20 years, during which time OU saw most of its more modern buildings designed and constructed.